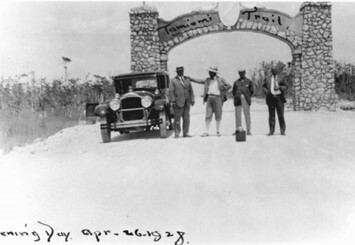 Completion of the long-awaited highway between Tampa and Miami - the Tamiami Trail - was a critical first step in Barron Collier’s masterplan to develop the region and in October 1923, he got the project underway. A retired naval officer and engineer, David Graham Copeland, was assigned the seemingly impossible task of building a town and modern highway in the Florida wilderness and began transforming the new County seat at Everglades into a modern communications and supply center. The Allen River was dredged to raise the level of the land above the mangrove swamps. Surveyors, engineers and architects designed new docks, buildings, homes, stores, schools, streets, and repair shops. Electric power, water, regular mail delivery, railroad and steamship service, a weekly newspaper, telephones and even an electric trolley were provided for the workers and residents of Everglades.